Soak sultanas and currants overnight in Bourbon. Melt chocolate in the microwave in 30-second bursts until melted, stir in butter. Warm cream in a saucepan with mixed spice, glucose, sorbitol and trimoline until sugars are dissolved. Pour onto chocolate and mix with a stick blender until smooth. 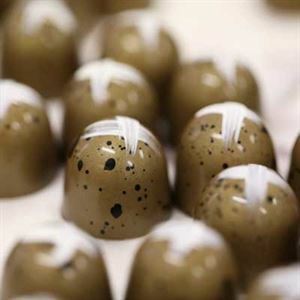 Cool to 28 C.
Place a sultana and currant into each truffle shell and pipe chocolate ganache to fill. Roll shells in tempered chocolate and paint a cross on top using white chocolate.